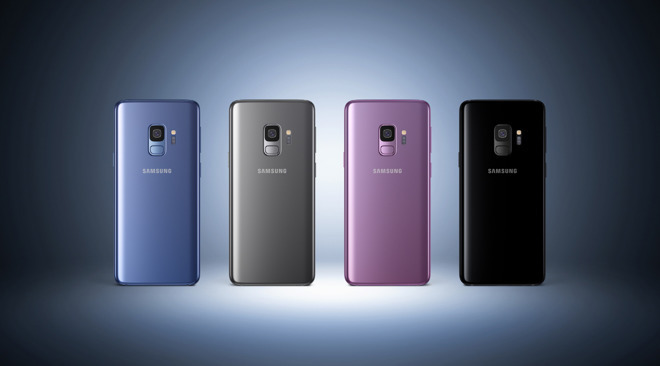 Revealed during its Samsung Unpacked event in Barcelona, the Galaxy S9 family follows on from the preceding Galaxy S8 in having an OLED display that fills most of the front of the device. Revealed in earlier leaks, this is a 5.8-inch curved sAMOLED screen with a Quad HD+ resolution and a pixel density of 570ppi for the S9, while the S9 Plus has a 6.2-inch curved sAMOLED display with a similar resolution and a 529ppi pixel density. The main draw for these devices are the rear camera arrangements, which primarily consists of a "Super Speed Dual Pixel" autofocus camera, which is capable of shooting at two different apertures. The fixed aperture of normal smartphone cameras are not able to adjust the amount of light entering the sensor, an issue Samsung believes to have fixed by switching between between F1.5 and F2.4 apertures, with the change helping improve picture quality. The S9 Plus adds in a second 12-megapixel autofocus camera sensor on the back, with a fixed aperture of F2.4 meant for telephoto shooting. All of the rear cameras also have optical image stabilization to minimize the effects of camera shake when taking a photograph. 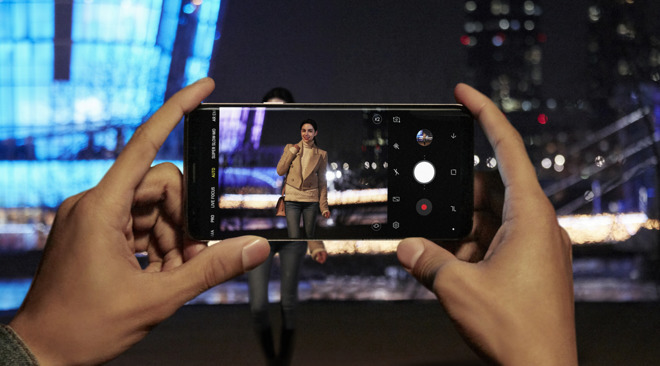 Samsung has also included a super slow motion function that is capable of capturing at 960 frames per second, a considerable jump in frame rate previously only seen in the camera sensor used in the Xperia XZ Premium last year. An automatic motion detection system is added to simplify the process, detecting movement in the frame and automatically recording once the the activity commences. After creating the video, users can then set suitable background music from a selection of 35 tracks, or one from their own playlist, with the video also able to be edited and created into an animated GIF for sharing online. On the front of both the S9 and S9 Plus is an 8-megapixel F1.7 camera with autofocus. 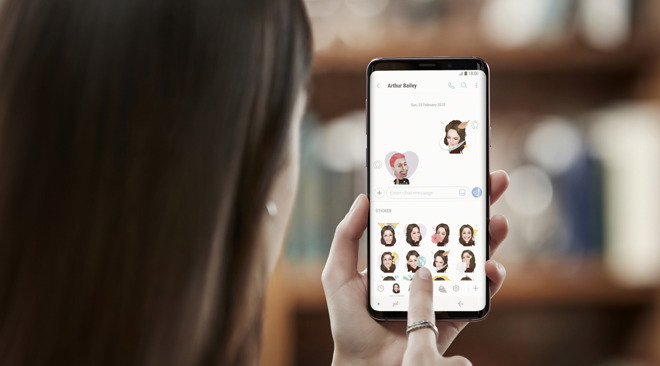 While it does not have the same camera array of Apple's iPhone X, Samsung does still use the front camera for a fun new feature it calls AR Emoji. Analyzing a 2D image of the user's face, AR Emoji uses machine learning to map out more than 100 facial features to create a 3D model, in turn producing an animated character based on the device owner. Able to be shown performing a number of emotes, such as winks and nods, it can turn these animations into a video, a GIF, or a sticker that can be used in most third-party messaging platforms. While it is distinctly different from Apple's own Animoji, it is likely to come under fire for seemingly attempting to copy Apple's iPhone X feature by having a somewhat similar name. Driving the phones is a 64-bit Octa-core processor made on a 10nm process. Depending on the market, this will include either four high performance cores clocked at 2.7GHz or 2.8GHz, matched with another four 1.7GHz cores. Both models will be offered with options for 64, 128, and 256 gigabytes of internal storage, with expansion of up to 400 gigabytes offered by the microSD slot. While the Galaxy S9 will have 4 gigabytes of RAM, the S9 Plus instead includes 6 gigabytes of memory. Samsung has included both wireless charging and fast wired charging in the new flagship smartphones, with the former compatible with WPC and PMA, and the latter with QC 2.0 connections. The Galaxy S9 houses a 3,000mAh battery, but the larger S9 Plus uses a 3,500mAh version. Biometric security consists of three different recognition methods, including iris recognition using an emitter and a sensor located near the front camera, facial recognition using the camera, and the rear fingerprint reader. Intelligent Scan combines the iris and facial recognition methods together for fast unlocking, while the Dedicated Fingerprint allows users to create a secure folder on the device opened by only one specific fingerprint, different from ones used for unlocking. Audio is provided by stereo speakers tuned by Harman subsidiary AKG, with it also including support for Dolby Atmos. For connectivity, support for dual-band Wi-Fi 802.11 ac, Bluetooth 5.0 LE, ANT+, USB type-C, NFC, and assorted global positioning systems, with both models including IP68 dust and water resistance. 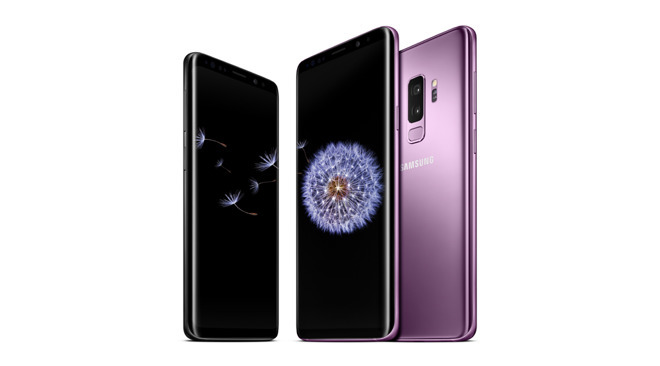 Samsung is expecting to ship the Samsung S9 and S9 Plus from March 16 in select markets, in a choice of Midnight Black, Titanium Gray, Coral Blue, and Lilac Purple color options. Pre-orders will commence March 2, with the S9 starting from $719 unlocked while the S9 Plus will start at $839.